The only question I get asked more often than if we need dentists (answer: YES! 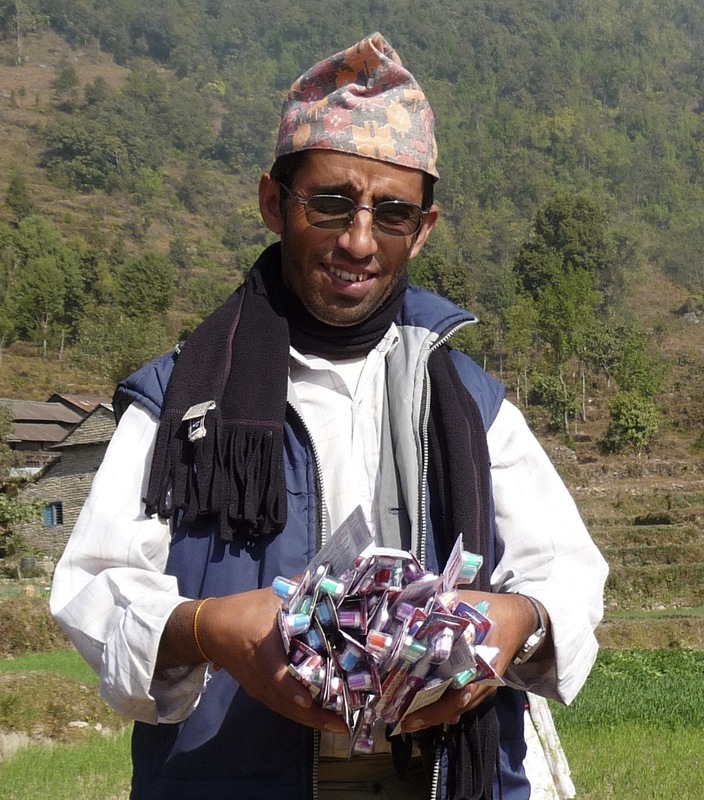 as mentors and teachers for Nepali technicians) is if we need donations of toothbrushes or paste. While that’s a conservative yes, because we provide a limited number of those supplies to schools, most of the time, the answer is, not really, unless they are donations of something purchasable in Nepal. Because, if you think about it for a second, it’s pretty obvious that going to some village and handing out a bunch of disposable hygiene products once might make for good photos, but it doesn’t do much for anyone who needs to use these items every day forever. Instead, one of the four core activities in JOHC is called Vendor Outreach, where we work with village shopkeepers to make sure that dental hygiene products are locally available and affordable, the same way sugar, salt, incense, and laundry soap are. In the past, vendor outreach has mainly consisted of having local JOHC teams – i.e. residents – visit the shops in their villages, look at products, talk to vendors about fluoridated toothpaste, and sometimes put up posters or stickers that help people identify toothpaste with fluoride. But this summer we’re working on stepping it up. The main reason is that schools need supplies to run their school brushing programs. For that, we provide brushes and paste on a declining schedule, but by the end of two years, either students or the schools have to finance $1 per student per year to run their brushing programs permanently. Even though this is extremely inexpensive, our experience has been that when supplies run out, often schools just don’t replace them. If we want schools to buy brushes and paste, they need to be extremely easy to get. 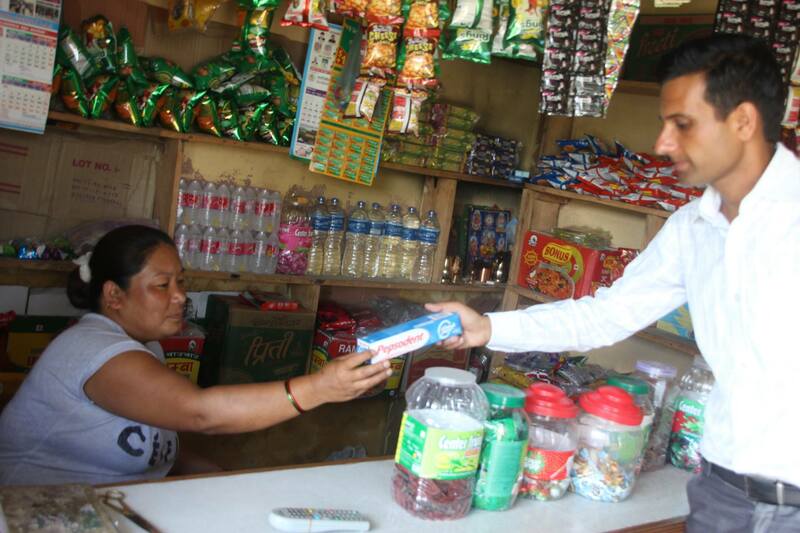 Therefore, in June, we started Vendor Outreach 2.0 by looking for the best-priced wholesale distributors in Pokhara, with the idea of setting up a direct link between village shopkeepers and the best possible deal on dental care products. But when we approached our first shopkeeper with this idea he told us he already buys his supplies from a wholesale truck that comes through his village on a regular schedule. Ok, we said, could we get the truck to go to the best-priced wholesale places? We showed the vendor the prices. The vendor showed them to his truck guy. The truck guy offered a better rate. Onward, then, to Salyan, one of our harder-to-access regions, where Gaurab was organizing a vendor outreach program for the following week. He had a list of about 25 shopkeepers and their phone numbers. It occurred to us that we should invite school teachers also, since the point was for the teachers who run the brushing programs to connect with the vendors who supply the products they need. This stroke of insight made us feel brilliant. Actually, that was a really good idea. Before the Gaurab’s trip out to Salyan for Vendor Outreach 2.0, I suggested that he print out little slips of paper with the location and contact info of the best wholesalers we’d found in Pokhara. That way we’d make sure all Salyan’s shopkeepers had this info in a nice tidy fashion. For the best deal. “So how’d it go?” I asked Gaurab back in the office on Tuesday. “They said they can totally visit the wholesalers we found if they happen to come to Pokhara,” he consoled me. “Pretty much,” Dilmaya chimes in. “I mean, they can use the wholesalers we found if they come to Pokhara,” Gaurab reminded me comfortingly. “Why is everyone going around handing out free dental supplies?” I demanded to nobody. We find this over and over. Our complicated ideas for fixing things are 99% irrelevant, with a critical 1% of something that is missing: information, a tool, a little encouragement, some social integration, a familiarizing element or formality. Vendor outreach will continue to involve oral health education for shopkeepers, because most people are not aware of the importance of fluoridated toothpaste in preventative care. But then it’s mostly a matter of building relationships between vendors and purchasers–especially between schools and specific local shops to source the supplies for their very affordable brushing programs. In other words, we need tea parties more than we need supply chains, more than we need products, more than we need anything that’s not already there. In conclusion, we’ll enthusiastically be taking donations of items such as art supplies for oral health games in schools, certificates of achievement for Oral Health Coordinators, funds we can spend on having local tailors sew brush holders, holding workshops, lobbying local leaders, creating teaching materials; and actually, if anyone wants to offer rides to our field officers out to Sindure and Rupakot and Salyan so they don’t have to spend so many hours walking or stuck on buses, that’d be great. Also, snacks. Help us out – there are many things we need to do our part well, and lots of opportunities to support communities in Nepal. As far as brushes and paste though, I think local shopkeepers figured this out quite some time ago. Duh.